I've seen this debunked on Facebook enough times. can't be so, James Woods just posted it. By no measure is the United States third in total homicides or homicide rates. Excluding the named cities from the count had little to no impact on the United States’ international standing. 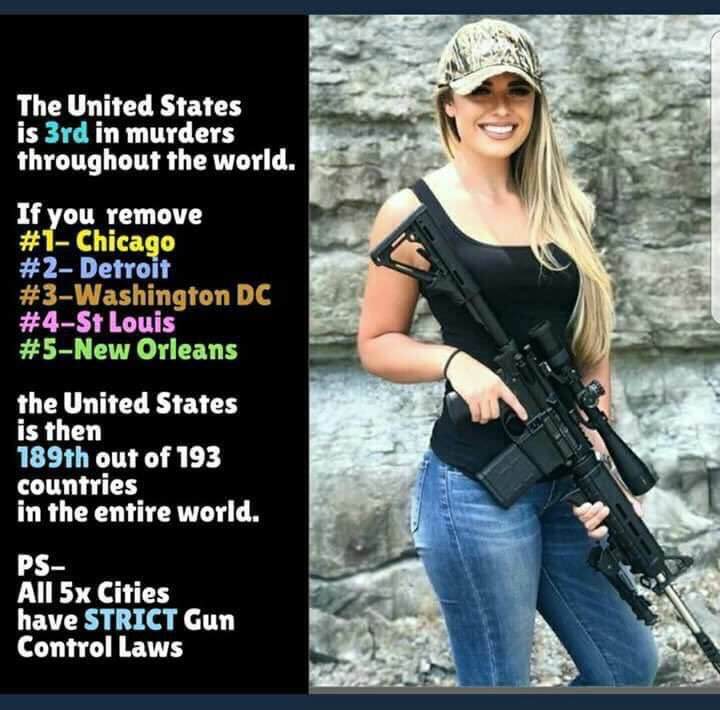 Three of the cities named in the meme are consistently the top cities for intentional homicides in the United States, but the other two are not. They are by no means outliers, either. ...insinuating there is some truth to it. Darn we are not in the top 100 going by any of those measures. Nice, we are a highly populated country, with many different cultures and we are doing good I guess. aren't they having hearings about the honesty of Facebook just this week? It's kind of like using Wikipedia as a reliable source and not checking anything else. It takes a brave man. I haven't seen those transcripts, but I can confirm that it's misleading. Of course cities have more gun violence; there are more people in them. Per capita statistics, however, paint a more complicated picture. Cities are largely affected by the gun laws of their states. Louisiana has very lax gun laws, which would explain why New Orleans has one of the highest crime rates in the United States. Yet New Orleans has become considerably safer over time in spite of this. St. Louis and Chicago similarly has become considerably safer in recent years. Hucksanders loves to talk about Chicago. She loves to claim that it is one of the most violent cities even though it has the strictest gun laws, but she conveniently neglects to mention that gun crime rates in Chicago have been dropping. She's also incorrect about Chicago having the strictest gun laws out of the larger cities. Stricter than many, yes, but not the strictest. In any case, a lot of the guns in Chicago are coming in not from Illinois, but from neighboring states that have very lax gun laws. She really should talk about cities like Boston and San Diego, which have relatively low gun crime rates per capita. It's probably no coincidence that they also happen to be in states have some of the strictest gun laws, but we all know that these sort of facts and correlations are meaningless to her. In my opinion, it always comes down to how you measure the numbers. You're right about the "murder rate" numbers. But......St Louis had 188 murders in 2015, that hardly was the highest number, but it was rated as highest per capita. South Bend, Indiana was on the list at 29th with, wait for it.....17 murders. Really???? Chicago had 478, considerably more than St Louis but was 24 spots below? There are lies, damned lies, & statistics. It all depends who you use them. BTW, Boston, your example, had 133 murders in 2015 but wasn't on the list.